Katie Meyler, a 32-year-old graduate of the University of Valley Forge, recently joined FDR, Ronald Reagan, Barack Obama, Albert Einstein, and Queen Elizabeth II as a Time Magazine Person of the Year honoree. Time’s Person of the Year feature seeks to recognize a person, or, in some cases, a group of people, who have had great influence over the past year. This year, Time chose to recognize “Ebola Fighters,” including Samaritan’s Purse doctor Kent Brantly, Doctors Without Borders health worker Ella Watson-Stryker, and many others who have battled the disease on the front lines. Katie Meyler grew up poor by the standards of what she now calls “U.S. poverty.” The family got food at a food bank and her mother worked a near-minimum wage job. Meyler now considers this an American version of poverty; the family still had food and the children were able to go to school for free. With the help of a scholarship, Meyler attended college and was hired by a non-profit to help promote literacy in Liberia. As she helped adults learn to read, she was deeply saddened by the plight of children. Most of them could not attend school, instead working on the streets. Girls as young as 10 were forced into prostitution. Many children begged Meyler to pay their school fees. “I would cry all night and send text messages to anyone whose phone number I could remember,” Meyler said. Three years later, Meyler began “More Than Me,” a non-profit that works to keep girls in school. She divided her time between working in Liberia and fundraising in America. 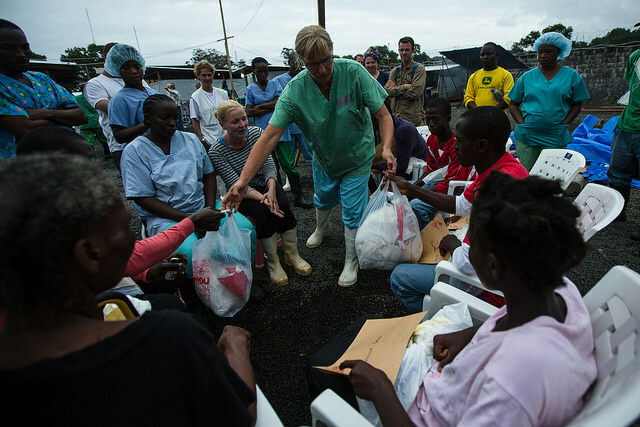 After the More Than Me Academy was closed due to ebola, Meyler used her resources to fight the disease.